A Hybrid magazine/shop/review/news WordPress Theme. First on Envato. Extended combinations of community functions (BuddyPress), multivendor store (WC Vendor), reputations system (MyCred), Store locator (Geo My WordPress), paid membership (S2Member), Price comparisons. Create your deal, idea, business, store, review site in one install. Paid plugins is not required, looks awesome with free versions. Also, theme includes Frontend plugin with support of paid submission. Poweful price comparison post layouts, scoreboxes, review lists, top pages, frontend adding price deals, smooth modern design. Plugin helps to make your content more valuable for visitors and search engines. With simple clicks adds content from youtube, google images, books, freebase, flickr, twitter, and much more. Also have affiliate modules. Free version has Amazon, CJ coupons, Affili.net Coupons. 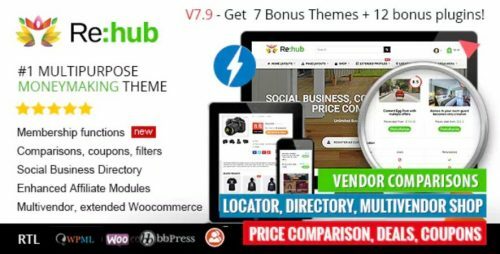 PRO version – Ebay wordpress module, Zanox wordpress, CJ, Aliexpress, Linkshare, Affili.net, Shareasale, Affiliate WIndow, Tradedoubler, Optimisedmedia, Flipkart and more f you need wordpress instrument to work with wiggle.com, Etsy.com, iherb, flipkart, Groupon, Banggood, Snapdeal, Shopclues, Home18, ect – I recommend to use Affiliate Egg plugin. We are also available to create custom parsers for theme for any site which has affiliate partnership program. Please, note, some pages on REWISE demo site uses Content Egg PRO version which is not in bundle, but free version is available and has all extended functions, like price alert and price tracker. Difference with PRO is only in number of affiliate modules. Ask discount coupon for PRO version in comments.